Pygmy rattlesnakes are very small. Adults rarely reach over two feet. The juvenile snakes have yellow tails, such as seen in the below photo. The rattles are very tiny, and can barely be seen or heard. The rattling may sound like a buzzing bee, if you hear it at all. However, this snake, though small and with inadequate warning, is very aggressive, and it has a nasty bite. Here is a photo of a Pygmy Rattlesnake. The Pigmy Rattlesnake (Sistrurus Miliarius) is one of the smallest species of Rattlesnakes to be found in the United States, and it is not the most dangerous rattlesnake that is to be found in the country either. This snake does have a reasonably large population, but they are very secretive so they are rarely seen, but they can become a pest or a danger if they are found in a domestic yard or garden. Because this species is one of the smallest of the rattlesnakes, its rattle is actually very small and this means that it is only audible from a very short distance away. The color patterns that can be found on the Pigmy Rattlesnakes can vary depending on its natural habitat, and these can vary with blotches and uniform patches running down the body which can be of various colors, from black and blue to dark green and various shades of red or brown. These snakes are not the most heavy bodied of snakes, and they will usually grow to between fourteen and twenty-two inches in length, but the largest known examples have been up to thirty inches in length. The head is generally in proportion with the body, and they will usually be encountered coiled up in the woods. These venomous snakes will eat a number of different small species, and these can include small frogs, insects, lizards and other small mammals. Their hunting technique is to ambush their prey by pouncing quickly from a hiding place among the leaf litter or other cover, and using their fangs to inject prey with venom. Although the Pigmy Rattlesnake is a very small snake, this doesn't mean that it is calmer and more docile when it encounters humans, and is likely to strike if it is cornered or threatened. Fortunately, the amount of venom that it can produce will not be life threatening for the majority of humans, but it can lead to a significant amount of discomfort and would need to be treated. One of the problems is that it can be very well hidden, meaning that many people may get bitten before they realize that they are threatening to the snake, especially because the rattle is very small and is often inaudible to humans. They will prefer to live in a burrow if possible, but because they don't dig their own they will often be seen in those vacated by a Gopher Tortoise. The species is found in much of North Carolina, Oklahoma, Florida and Texas, and will often be looking for specific habitats that will suit their habits. 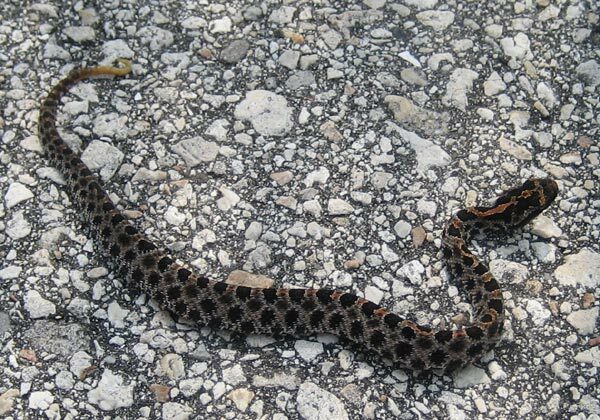 This will generally mean that there is plenty of leaf litter, meaning that woodlands and mixed forests are particularly likely to be home to the Pigmy Rattlesnake, but sand-hills and marshes can also be home to these snakes. The mating season for this snake is during the spring, and the majority of snakes will usually give birth in August, and they do give birth to an average of around six live juvenile snakes. The larger the female is when she gives birth, the larger the offspring will be, but they are generally only five to seven inches in length. These young snakes will grow gradually for the first two years, and are independent from birth. They will usually grow into their sexual maturity in their second year. Unfortunately there isn't a large amount of research in terms of their lifespan in the wild, but those kept in captivity have lived up to twenty years, though those in the wild are likely to live for a much shorter time than this.